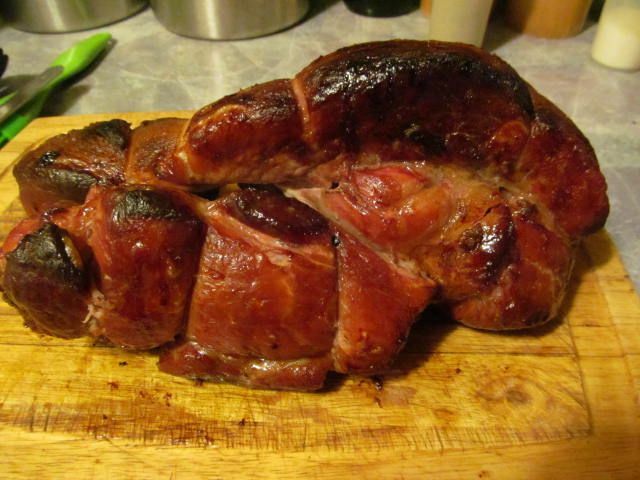 I plunged the ham into ice water to stop the cooking process, the put the ham in a plastic bag for dinner the next night. 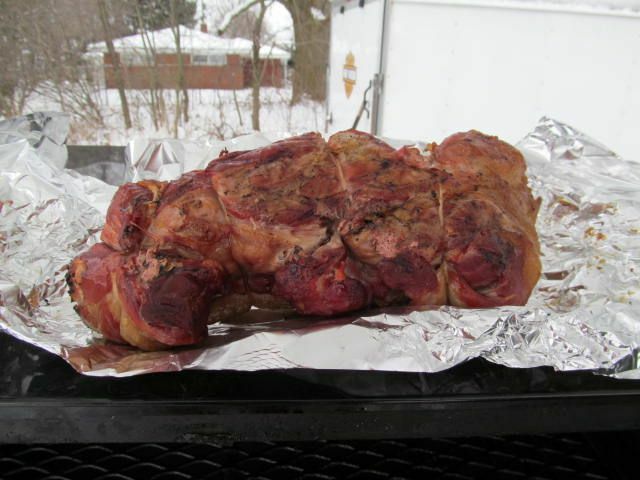 Since we only took the ham to 150 F, it was not quite done. 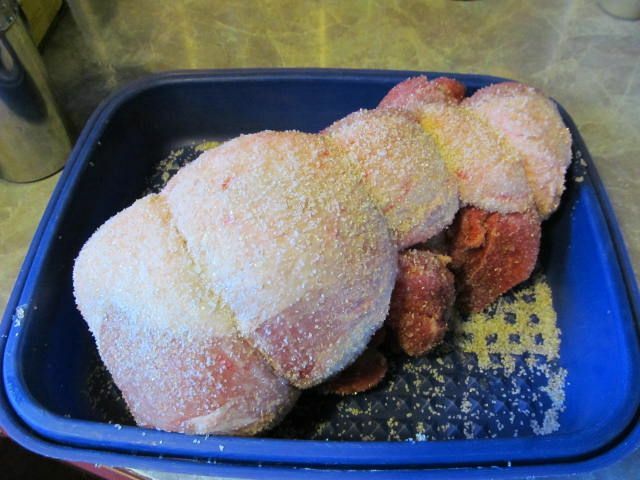 So, the smoked partially, cooked ham went into our stoneware pan, then into a 350 F oven until the internal temperature came to 165 F.
As you can see, the internal part of the ham looks like your standard pork roast. 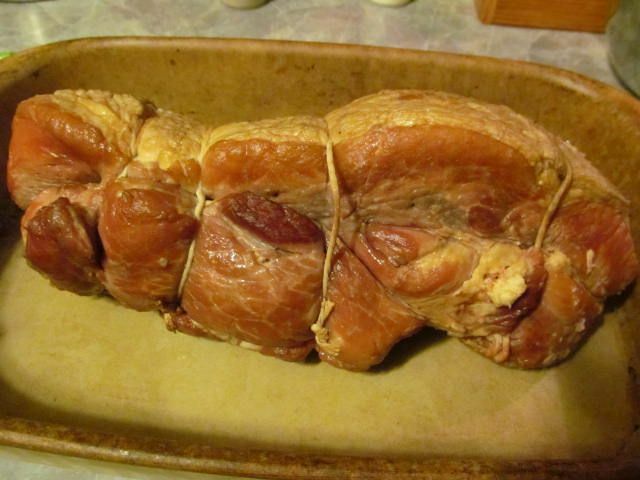 One reason why is that I did not use any nitrates in the cure of the ham. Nitrates help to add that pink color during the cooking process. 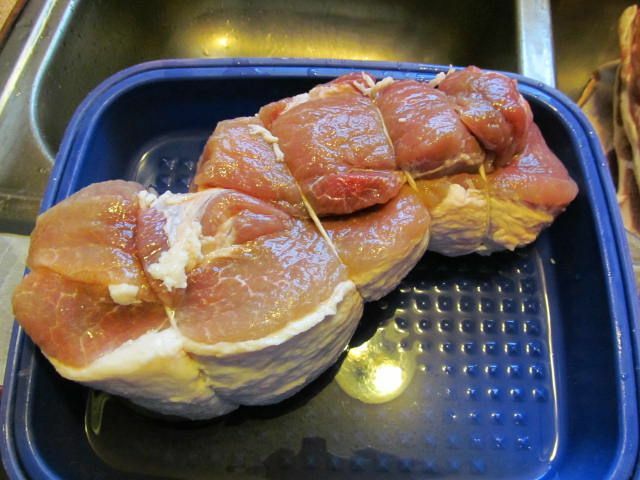 The other reason is because I did not get the salt/sugar mix into the middle of the pork as well as I thought I did. Rest assured, it tasted like ham, 110%. Hope is my biggest critic when it comes to cooking. She is never afraid to voice her opinion: good, bad or indifferent. Her opinion? It was the best ham she had had. Not too salty and just the right amount of sweet. Perfect! What will I try differently the next time? 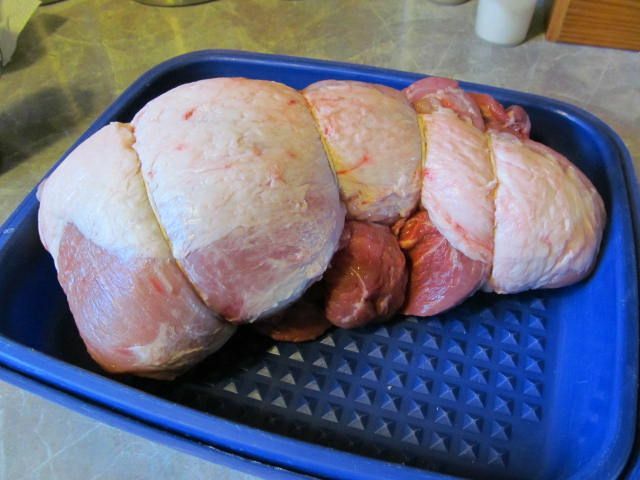 I will dissolve some salt/sugar mix and inject into the middle of the meat in an attempt to get a more even cure. I might also lengthen the cure time to eight days. Other than that, there is nothing to change at all. I am happy at my first attempt at a home cured ham. 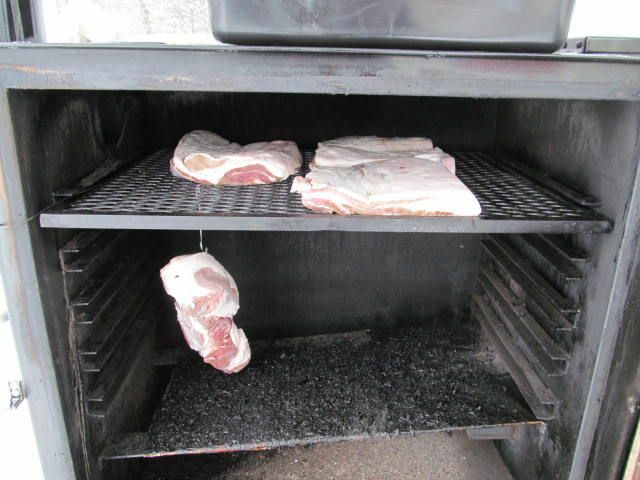 Have you tried curing and smoking pork shoulder? 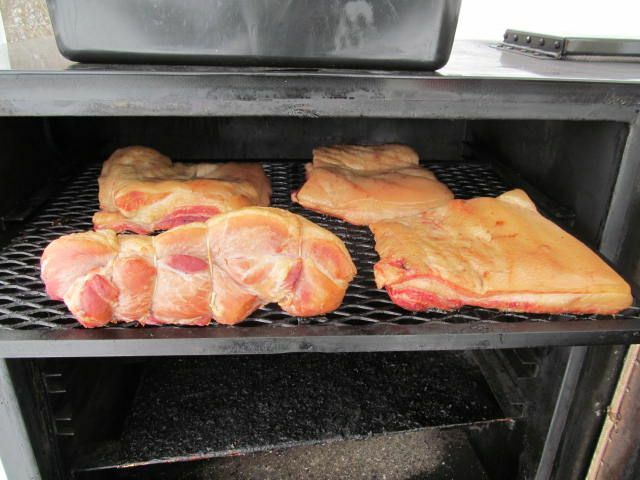 I have had good results making buckboard bacon using Hi-Mountains cure. I have not tried a whole ham yet. Injections sound right. You could also try a wet brine. I know have a craving for a ham sandwich. 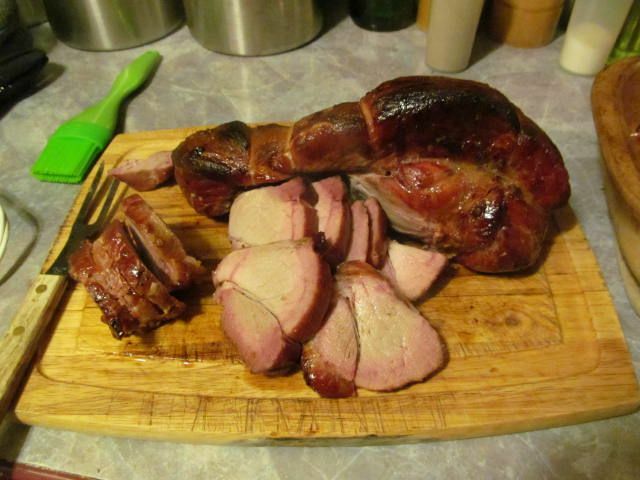 Chiliebrown, I was quite happy with my first attempt at a ham. 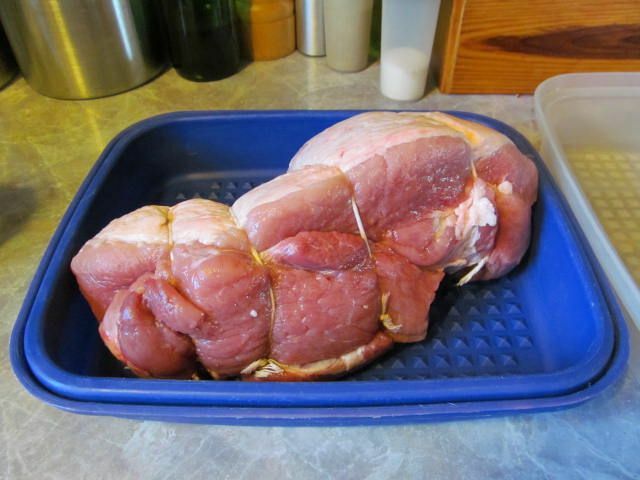 I am going to make some brine to inject the inside of the ham and then use the outer coating for the outside. Would you put some Lowensenf on said ham sandwich? I would put some ham on my Lowensenf sandwich.